Saxophonist Xhosa Cole won this year’s BBC Young Jazz Musician at the weekend for his “heartfelt” performance. The 22-year-old from Handsworth, Birmingham, played his way to victory beating four other finalists with a 16-minute set. Cole performed his own composition “Moving Ladywood” as well as “I Cover The Waterfront”, by Johnny Green and John Coltrane’s “Moment’s Notice”, backed by a band led by Gwilym Simcock on piano. The Birmingham musician spoke to Diane Parkes earlier this year about composing and playing across the city and beyond. He credits the city’s Town Hall Symphony Hall for helping him achieve success. The 22-year-old, who grew up in Handsworth, attended Holyhead School and now lives in Ladywood, first began playing at the Ladywood Community School of Music founded by legendary saxophonist and composer Andy Hamilton. There Xhosa joined a weekly jazz band and was supported by Birmingham’s Music Service to have his own saxophone. Fired with enthusiasm, the youngster was involved in as many classes and workshops as he could manage - including the summer schools run by THSH’s Jazzlines. Xhosa first developed his love for the saxophone nearly ten years ago. As he learned his craft, Xhosa faced a dilemma – which direction to take his music into. “I remember in the Jazzlines summer school of 2015 I was undecided between the classical saxophone and the jazz saxophone and it was one conversation with Percy Pursglove on that summer school which tilted the scales. When Percy tells you to do the jazz course, you do the jazz course – and my music and my life would probably be totally different if I’d chosen the classical. And he believes the support from THSH has helped him in many different ways. “I can’t even begin to count the number of times I’ve been into the THSH buildings to watch, to play or to learn. 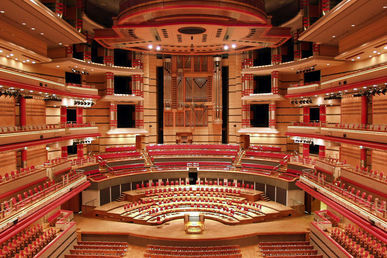 I think my first experience of playing on stage at Symphony Hall was through the Music Service because they used to do their gala concerts there. You’re sitting there thinking ‘I’m in one of the best halls in the world’ and you just make the most of it. I couldn’t imagine Birmingham without THSH. “I’m also part of their talent development programme and I’m still fortunate to be getting workshops through THSH. The latest one, just a few weeks ago, was with Tim Berne in the foyer of Symphony Hall. It was amazing to work with him. “As a freelance musician one of the biggest things I struggle with is finding the space to practise and THSH has been really generous in letting me have access to the Patrick Studio and the foyer at Symphony Hall. That has been phenomenal as these are beautiful spaces to be able to practise in.